Upon hearing the phrase modern dining table, you may think of contemporary designs that don’t quite fit with the average home. That doesn’t have to be the case. Trendy dining rooms come in all shapes, forms and styles. A quirky vintage industrial style dining table can bring character to a room, or a rustic wooden table can bring a cosy, down-to-earth vibe. Style more traditional tables with plush upholstered chairs for a contemporary twist. Why not mix two styles together? A modern contemporary dining table with an industrial edge would suit a large, urban kitchen or dining room. A copper or brass table top on a simple pine base is the ideal way to achieve this look; pair with ribbed leather chairs in black or tan for a muted colour scheme or bright colours for a more vibrant appearance. Bars and restaurants could make good use of space saving dining tables. Stackable tables are perfect for storing as extras ready to bring out at busy periods, and in generally come in handy when it’s time to clean the floors. Wooden topped tables with tubular metal legs work well with minimalist themes, and their vintage inspired style will add charm to any space. Stacking chairs are the ideal partner to stackable tables. Poseur tables are also a firm favourite with commercial eateries – the perfect pairing to modern bar stools. Being economic with space isn’t just for bars and restaurants; increasingly, domestic dining areas are adopting a minimalist style. Offices converted to flats or upmarket apartments are often tight for space. Space saving dining tables are ideal for these small kitchens and open-plan living areas, and poseur tables are the ideal alternative to a breakfast bar – find your perfect modern contemporary dining table that fits any room. Industrial and vintage style furniture is very trendy right now, and may be just what you need to bring your kitchen dining area up to date. There are so many unique styles out there, whether it’s a table inspired by an old school science bench, or inspired by a factory workbench with a metal top. The 1960s/1970s brought us style in many shapes and forms, and these retro designs are reappearing in contemporary furniture. Whatever you desire for your kitchen or dining room, your modern dining table or kitchen table can be anything you want it to be. There’s no end to what you might find! Pedestal dining tables are the ideal centrepiece for any dining room, kitchen or restaurant. Available in a range of shapes, styles and sizes, pedestal dining room tables are a stylish addition to any space. Choose a large, traditional table for spacious areas, or opt for a smaller pedestal kitchen table if you have limited room. If you like more traditional furniture, why not choose a rustic pedestal table? A larger pedestal dining room table will have a double pedestal base; the two feet are usually connected by a cross-stretcher. 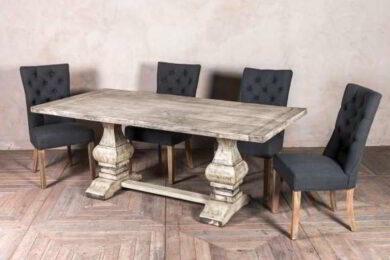 These tables tend to have a chunky, rustic appearance with lots of character and are ideal for dining rooms or large farmhouse kitchens. The finish on the wood is also very important. For a chunky, rectangular pedestal table, we recommend a waxed finish – this maintains the traditional style of the table and adds to its rustic character. Limed pedestal tables look great in farmhouse kitchens, or rooms with a vintage style. Often, matching benches are available to complete the look. A distressed table and matching bench could also be paired with upholstered chairs for a more modern, shabby chic vibe. For a modern feel, choose a slightly slimmer table. You can keep the chunky double base, but go for a thinner top to compliment smaller rooms or more contemporary styled interiors. The limed wash we mentioned previously works well with both modern and traditional interiors, and is the ideal mid-point between rustic and modern. It is great for those searching for something with more character than the waxed finish, but that isn’t full-on colour. This subtle finish can really make your dining table stand out as the focal point of your room. The pedestal is a really flexible base option and allows more chairs to be placed around the table than a table with four legs. This space-saving design is true of both a single pedestal table base, and a double pedestal table base. Double pedestal bases tend to suit larger tables, and they are more frequently seen in home kitchens and dining rooms. However, this style isn’t just for homes. Double pedestal tables also look great as feature tables in restaurants, bars, and even office meeting rooms. Paired with glamorous chairs, this makes for a stand-out furniture set up. It’s an effortless way to dress up a drab work environment, or add tons of style to a chic restaurant. Single pedestal bases are also ideal for homes, but tend to be more suitable for smaller spaces, such as flats or apartments. The smaller size of the single pedestal dining table makes it a popular choice for commercial environments; perfect for restaurants, pubs, bars, cafes and bistros. Again, the pedestal design allows more chairs to be placed around it, which is why this style of table is a firm favourite with businesses who are keen to maximise on space. Many modern pedestal tables are made to order from new or reclaimed wood, allowing you to customise the size and finish to suit your interior. When made from reclaimed wood, the tables feature knots and grooves, which make each piece of furniture unique..
A wooden pedestal table is a stunning way to add character to a kitchen or dining room. Placed over an oriental carpet or plush rug, a strong feature table can make a huge change to the styling of a room. 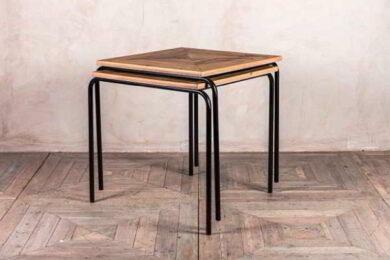 Equally, metal top tables are on-trend at the moment and can add an industrial edge to a home or business. Vintage furniture will never go out of fashion because it is just that, vintage. They say fashion comes in circles, and that is often true for interior design. Vintage furniture can be used in retro or modern interiors, either to create a theme or simply to accessorise. Furniture can be used to accent, and the right piece can bring a room alive. 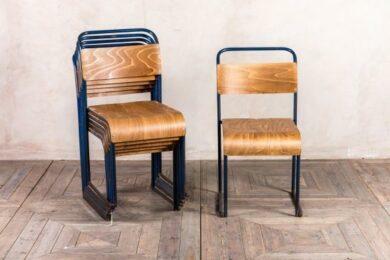 Vintage stacking chairs are the epitome of useful retro furniture. From dining chairs in restaurants to seating in office meeting rooms, stacking chairs are about as versatile as it gets. Most were once school chairs or church hall chairs, and their marks of wear and tear add to the character they provide. So many styles are out there to choose from. Upholstered chairs with padded seats, chairs with neon painted frames, armchairs… the options are endless. Stacking chairs are a particularly popular choice for businesses. Due to their stacking ability, they are the perfect chairs to keep as spares for bringing out during busy periods. Not only that, but they can be stacked away to make floor cleaning easier. Quirky cafes, industrial style bars, even home kitchens can benefit from vintage stacking chairs. They are ideal for adding a pop of colour – if you’re choosing one with a brightly coloured frame – or simply some industrial vintage style. Their ‘lived-in’ look perfectly suits industrial inspired interiors. 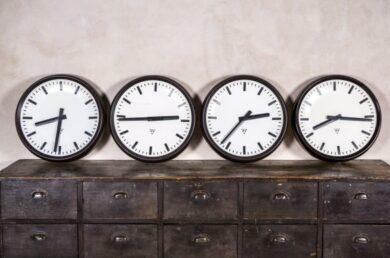 A quirky vintage accessory makes for a great focal point for any room. A retro ornament can add a touch of nostalgia that gets people talking. Vintage clocks and other wall decorations can tie in beautifully with modern interiors, and odd finds such as old beer crates and steamer trunks can be given new leases of life as funky coffee tables or footstools. The beauty of vintage is that you can upcycle it to be whatever you want it to be. Vintage and industrial inspired restaurants, cafes and bars are perfect places to make good use out of industrial furniture. 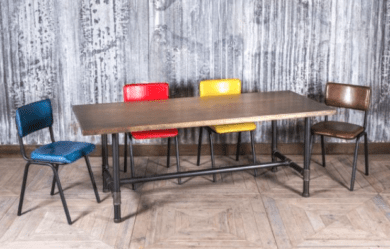 Vintage school chairs provide versatile dining seating, whilst larger pieces can be used in numerous ways. Industrial trolleys make quirky serving trolleys, old mining carts can be transformed into distinctive tables, and factory pigeon holes are just the right size to display bar snacks. 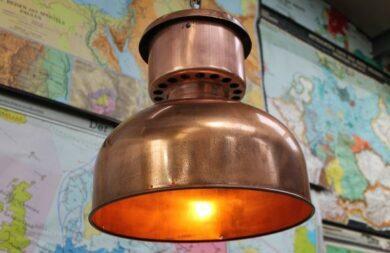 And it isn’t all about dining furniture and vintage storage, industrial lighting is also very popular. Large industrial pendant lights add an urban edge to retail and food establishments, and even look good in domestic kitchens above breakfast bars. Whether you’re decorating your home, furnishing an office, or adding the finishing touches to a boutique hair salon, there’s something vintage out there for you. Currently inspiring our staff are UK-based Peppermill Interiors who supply a range of vintage furniture which is both beautiful and affordable. Upholstered furniture is very on-trend right now, and may be just the thing you need to refresh your interior. With a wide variety of styles, sizes and materials on offer, there’s something for every room. Whether you’re adding an accent chair to a bedroom, refreshing your dining area with comfortable fabric-covered seating, or adding a luxurious sofa to your living room, upholstered furniture adds class and style to any space. If you’re feeling brave, why not create your own custom fabric furniture? Some of the best upholstered sofas, chairs and benches started life with a completely different look. Beautiful fabric furniture isn’t just for homes. Upholstered seating is something that can add a touch of luxury to a range of spaces. Fabric upholstered furniture works well in offices, cafes, bars and hotels. An upholstered bench with back is a must-have piece; the back adds further comfort and allows the bench to be used in a variety of different settings. A fabric sofa or bench of this sort can be used in the waiting area of a hair salon, or it could be used in a shoe shop as somewhere to sit while trying on footwear. We also recommend this type of seating as a great alternative to dining chairs for a kitchen, dining room or restaurant setting. You can see great examples of upholstery in French style furniture. You could consider a French style sofa bench, which is a modern take on traditional Parisian design, and would add a touch of luxury to a bar, boutique hotel or spa. Contemporary colours include cream, grey and stone. Often having deep buttoned backs, these comfortable and sophisticated sofas exude elegance and style. Don’t restrict yourself to ‘what it says on the tin’, there are some fabulous upholstered dining chairs on the market today that would make wonderful accent chairs or feature chairs for a bedroom, hallway or living room. When searching for the perfect upholstered feature chair, choose an oversized chair – one that is slightly larger than a standard dining chair. We find that carver chairs can often be more decorative than side chairs, and the added arms give extra comfort and can make your new accent chair double up as a small armchair. French style upholstered armchairs are a glamorous choice. These elegant, fabric-covered carver chairs radiate class. Why not go for a buttoned outer back that adds further detail to the chair and ensures it looks fantastic from all angles? This style of chair would also work well in a salon, adding to the feeling of being pampered. Accent chairs would be the perfect addition to a dressing table area, and could be complimented with large, plush cushions or other upholstered furniture. If you’re searching for a simple way to add upholstered furniture to your interior, look no further than your kitchen or dining area. Upholstered kitchen chairs are an easy way to get your fabric furniture fix. To enhance a dining area, be that in a home or restaurant, choose unique furniture, such as linen upholstered dining chairs to give your room a fresh feel. Grey fabrics work well in darker spaces, and cream for more neutral interiors. Don’t stop at side chairs – if you took our advice on accent chairs, you can add carvers in a complementing material to the ends of your dining table when you have extra guests, and then use them as standalone feature chairs when they are not in use!